Arjan de Kock had pretty much given up on "The Big Island" 8C, the desperately condition dependant project he had been besieging all winter long as Fontainebleau moved into the warmer spring and summer months. However an April cold snap brought unexpected success for Arjan on another line he'd been working, the low start to "Satan i Helvete", which bumps the grade up a notch to 8B+ (he'd done the higher start in Feb). 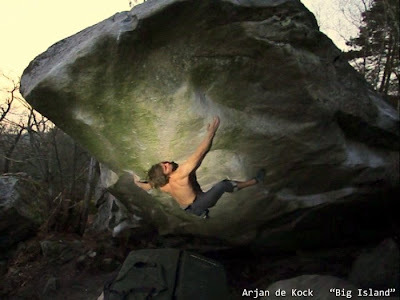 With renewed confidence, Arjan returned to "The Big Island" and became the 1st South African to boulder 8C!